Local students experienced science at work today using robots to navigate their way around Gladstone Harbour and pilot a tanker to collect Liquified Natural Gas (LNG). 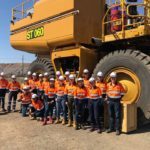 Staff from ConocoPhillips, downstream operator of Australia Pacific LNG, mentored 50 students at the Queensland Minerals and Energy Academy (QMEA) Beakers. Bot. Build event at Toolooa State High School. Students from Gladstone and Tannum Sands State High Schools and Chanel College participated in the day-long science, technology, engineering and maths (STEM) challenge designed to test problem solving, analysis and team work. “The activities the students undertake demonstrate the technological nature of the LNG industry,” said Robert Gibb, Communities and Sustainable Development Manager for ConocoPhillips. “Events like this help students to see how what they learn in the classroom transfers into the workplace and why STEM pathways are the foundation for many careers in the LNG industry. 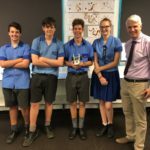 “ConocoPhillips is a keen supporter of STEM education and this is the seventh year we have supported QMEA in Gladstone,” he said. People working in the minerals and energy sector have been involved in creating the challenges, which reflect many practices that apply to their operations. It is this close link to the world of work that Toolooa State High School Principal Justin Harrison values the most. “At Toolooa SHS we value how all the activities bring real-world context straight to the students,” he said. Industry professionals give first-hand insight into how these challenges are used in their roles and highlight the transferable nature of STEM skills.